CEO of ExxonMobil admits burning fossil fuels warms the planet. 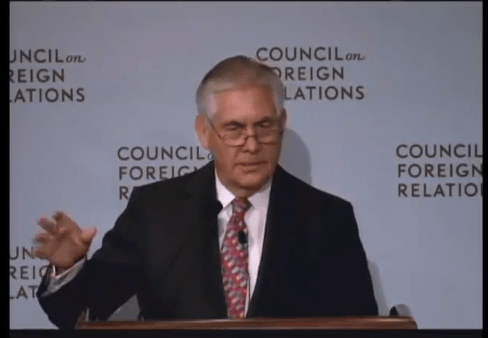 CEO of ExxonMobil, Rex Tillerson, in an on-the-record speech to the Council of Foreign Relations that is publicly available online, has now said that it is clear that burning fossil fuels warms the planet. I discovered this video in an article by Bill Blackmore on the US ABC News about how American news directors just aren’t covering the latest stories on climate change – possibly because of political and corporate agendas but also possibly because it’s TOO BIG TO HANDLE. It’s worth a read but I think it’s letting news directors off the hook. The real reasons they aren’t talking about the new data is due to corporate agendas. Yes, the story is huge. Of course it is. But that’s only MORE reason to give it the coverage it deserves. Where’s Will McAvoy when you need him?